NORTH KOHALA, Hawaii » A bill passed by the Legislature over the veto of Gov. Linda Lingle will help preserve the unique Mookini Heiau near the northern tip of the Big Island, says Leimomi Lum, the kahuna nui, or high priestess, of the ancient Hawaiian temple. The new law requires the state to consult with the kahuna nui on any proposed changes at the temple site, believed to date to A.D. 480. Proposals have been floated, such as bringing tour buses to the heiau, which would badly affect the cultural and spiritual atmosphere of the undeveloped, windswept area, Lum said. The new law makes Lum or her successors the only kahuna nui in Hawaii to receive such recognition. Lingle vetoed the consultation mandate, saying consultation should not take place with just one person. She said other parties that should be consulted are the Office of Hawaiian Affairs; Kamehameha Schools, which owns immediately adjoining land; the Kohala Hawaiian Civic Club; and the Luhiau family, which has an interest in a related, smaller heiau about seven miles to the east. The requirement for consultation with the kahuna nui already exists in the deed by which the state acquired the site from Oceanic Properties and Bishop Estate, Lum said. But the state has made repeated attempts to ignore or erode the mandate, she said. As often as once a year, state officials seek permission to do archaeological excavations inside the 30-foot-high walls of the heiau, despite the fact that the deed bans excavations, said Lum's husband, Alexis, a retired general who formerly headed the state National Guard. Years ago, Lum found a state archaeologist digging in the heiau. A former Honolulu police officer, Lum told the woman to get out or Lum would carry her out. More recently, Kamehameha Schools considered establishing a live-in cultural teaching facility near the heiau, Lum said. Kamehameha spokesman Kekoa Paulsen said such an idea was discussed but that Kamehameha is not pursuing it. Someone -- Lum would not say who -- also proposed bringing tour buses to the site, which currently has no paved road, bathrooms, power lines or other signs of modern life, Lum said. The new law says the kahuna nui must be consulted on any such commercial ventures. One of Lum's granddaughters is being trained to take over the kahuna nui post someday, Lum said. Thus, the law calls for consultation with the person who holds the post, not merely Lum herself. The heiau was designated a national historic landmark in 1963. Lum became kahuna nui in 1978. 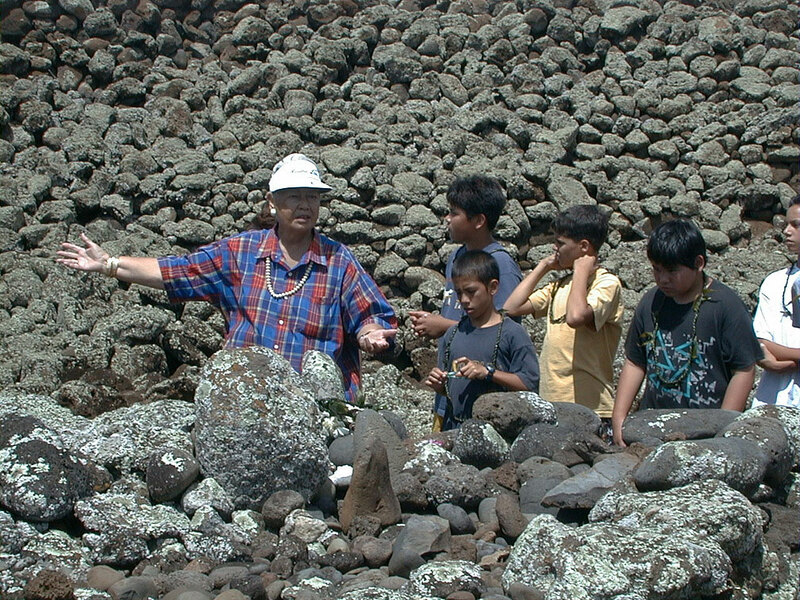 Although the heiau had been used for human sacrifices, Lum removed that "kapu" and dedicated the heiau first to the children of Hawaii and later to the children of the world. Oct. 25 will be the 28th anniversary of her holding annual children's days at the heiau. She expects about as many as last year, around 900.